Who are the people in your neighbourhood? If you live in Nigeria, you probably run into all sorts of characters on a daily basis. Of course, where you live and what your social status is influence the type of crowd you run with, but regardless of where you’ve been and who you are, if you live or are in Nigeria, sooner or later, you will run into all of the following people. Lurking in the shadowy corners of Nigerian society, The Oga Kpata Kpata controls everything from behind a mysterious office door. Recipients of his favour flourish, while those who cross him are never heard from again. Only his closest associates know his true identity but his hand is felt by the poor and the powerful alike. His cronies are everywhere so watch what you say. You never know who is in The Oga Kpata Kpata’s pocket or on his payroll. Good luck trying to get an appointment. 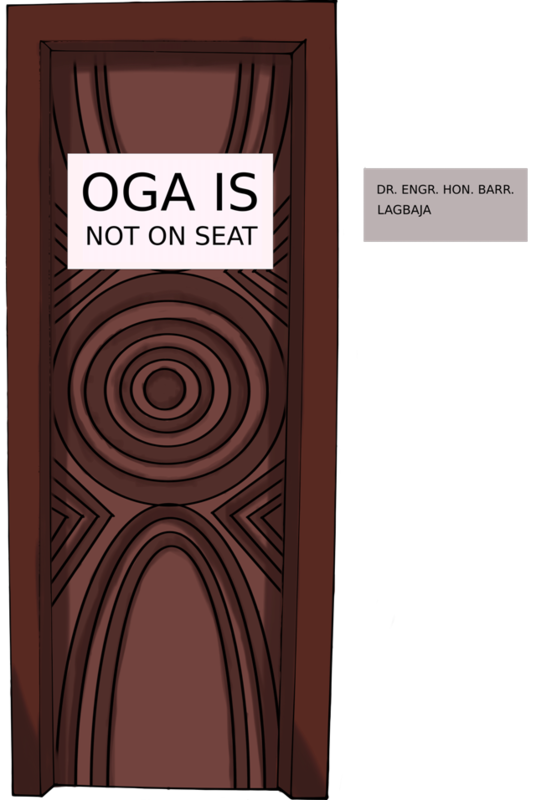 Oga is not on seat. Natural Habitat: Behind scenes of politics, money, and power. Probably everywhere but mostly unknown. No one has ever actually laid eyes on The Oga Kpata Kpata. Notable Habits: Signing murky contracts in the dead of the night. It is rumoured that many Oga Kpata Kpatas are secretly Cash Madams. Natural Enemies: None. They’ve all been quietly dealt with. Love this series! I hope you do a second round there were some we never got to like: Ajebutter and Johnny Just Come.. I was actually thinking about continuing the series. Maybe I shall soon. I’m glad you love it! !